Support this site and be the envy of everyone at your next jam or festival with an oldtimejam.com t-shirt! These are Gildan 100% “ultra cotton” shirts, and are available in X-large, large, and medium (they run slightly small, IMO, if that helps). If you’d like another size, send me a note and I can add it to my next order. 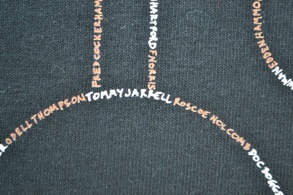 Shirts are $20 each (plus $2 shipping), or $10 when purchased along with a lifetime membership. 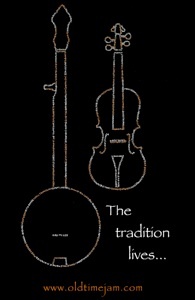 T-Shirt #1: "The Tradition Lives"
This latest design pays homage to our gone but not forgotten heroes of old-time music. At first glance, you’ll see an image of a banjo and fiddle. 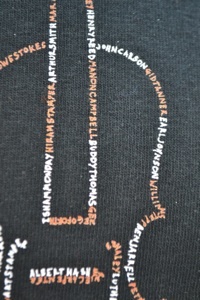 Upon closer inspection (see images below), you’ll find that each instrument is composed of the names of old-time banjoists and fiddlers (each on their respective instrument) - musicians who continue to inspire us today, and whose tradition we carry forward. 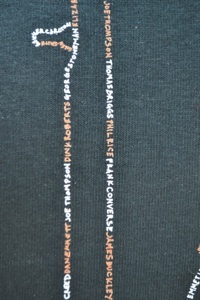 For a complete list of the names on the shirt, click here. 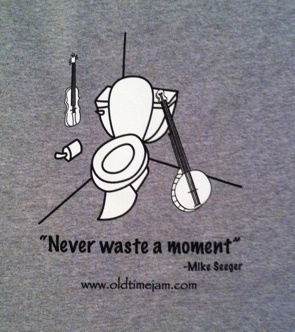 T-Shirt #2: "Never Waste a Moment"
I figure almost every old-time musician can relate to this story.